What works in Greece does not work for me here in my New England kitchen. 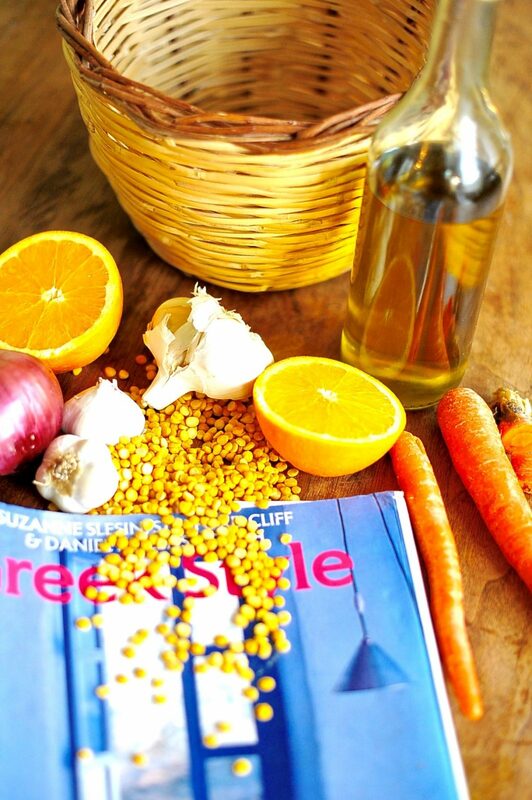 The yellow lentils I buy do not contain a summer’s worth of sunlight in each bite as do the greek. Our pale lemons are stingy with their vapid juice. I have cooked the lentils in carrots (an old trick I learned in Israel to flavour garbanzos) to add depth. There is also the addition of a splash of orange juice to bring the flavours closer to the island lemons I am used to tasting. If my island were a pallette of paint cans, laid on a dusty shelf in a hardware store, their soft glow would draw customers from all departments. People would absently crumble their lists as they gazed at Goat-bell yellow and Retsina gold. 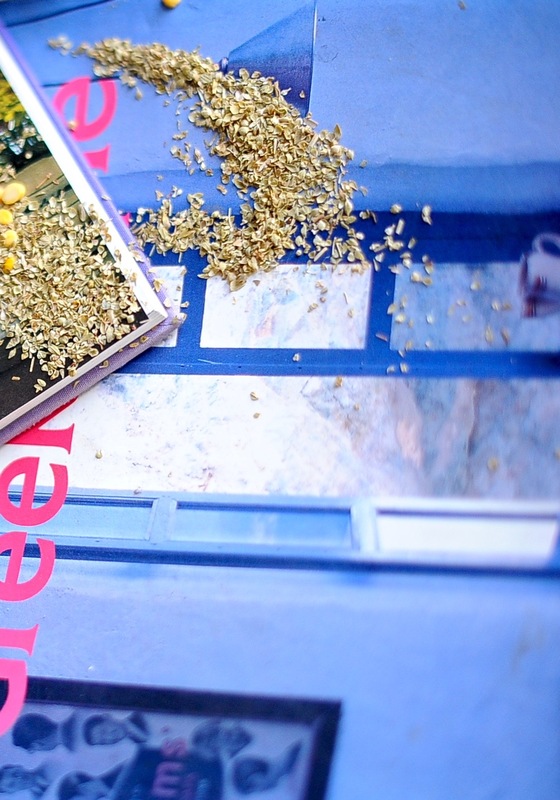 Baskets filled with hammers and nails would fall to the floor as busy men forgot their projects and stared longingly at shades of Spring Rain green and Sea Urchin mauve. Women would slip off their shoes and stand soft footed on the cold cement, as they contemplated Almond Blossom pink and Sea-glass blue. Hairpins would fall like pine needles in front of the Meltemi Grey. At the sight of Widow’s black, a wild yearning would rise in them. A yearning to feel polished stones beneath their feet, to walk the sea road and taste the dust that rises with each foot fall. They would note how the drips of Dawn white tinted to rose at sun-set, lavender at dusk and finally shaded to an indigo night sky that sparkled with all the lights of the Peloponnese. 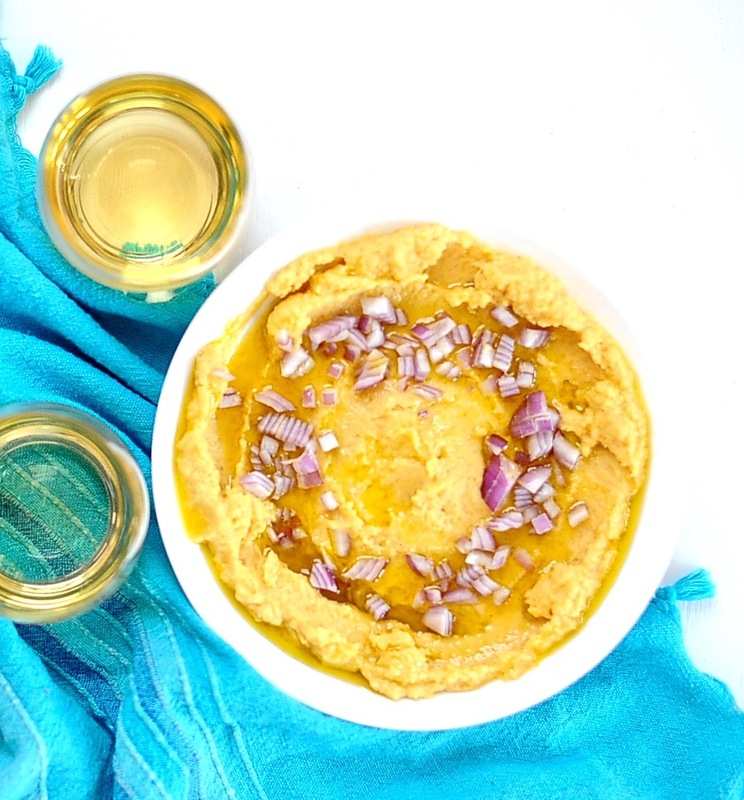 Fava spread is nothing more than a puree of yellow lentils topped with diced sharp red onion. Fava spread is nothing less then the promise of golden days and satin seas. 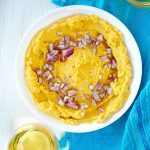 Mashed yellow lentils topped with red onion and a generous splash of olive oil make a wonderful appetizer. Fava was meant to be shared with a friend. 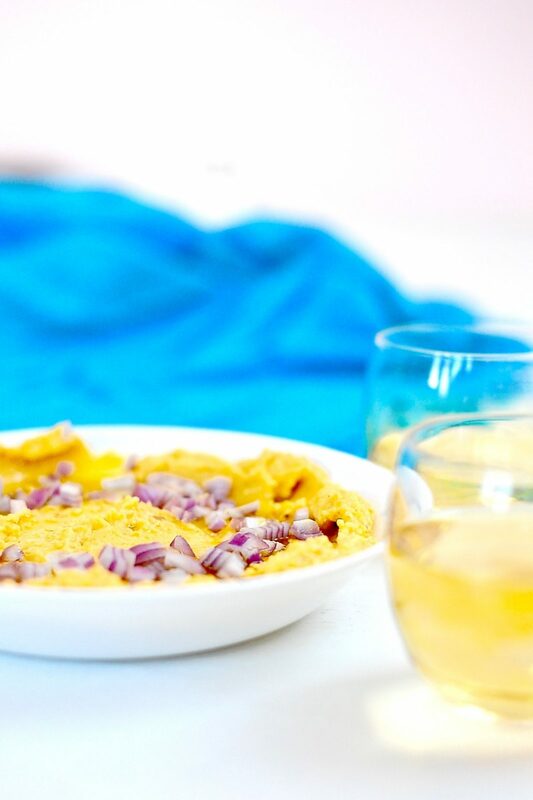 A loaf of crusty bread, a bowl of faba and a bottle of retsina makes for a romantic lunch. Simmer lentils on low with water, oregano, turmeric, carrot, yellow onion, salt, mashed garlic cloves, oregano and turmeric, till ridiculously mushy. Keep adding water as necessary. You want a porridge like texture. Mine took 1 1/2 hours. Remove from the heat. Fish out the carrot and onion. It is okay if a bit of carrot remains it will add color. Mash in pot with a spoon or in food processor until it still retains a shadow of split pea shapes but is mainly mash (like a well cooked oatmeal porridge). Scoop into shallow bowl, squeeze lemon and orange over the top, splash on a mediterranean amount of golden olive oil, a little salt, a little pepper and you are ready to dive in. The book in photos #1 #2 and #3 is Greek Style by Suzanne Slesin (Author), Stafford Cliff (Author), Daniel Rozensztroch (Author), and Gil de Chabaneix (Photographer). Published by Clarkson Potter. It is a wonderful book. Would love to start my day with your fava. I wonder how one knows if an onion is sharp or dull and tasteless? So many times I’ve been disappointed by onions…. but don’t want to make this a sad story would just love to know how to find onions that are as crunchy as sharp as Greek onions? 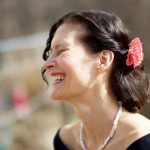 Thanks for the blog post. A great way to start my day before it even gets light. Buy your onions on Hydra, and they will be sharp and fresh. From the little research I did on line, Americans favor sweet onions, whether red or yellow. When an american recipe tells me how to get the bitter taste our of broccoli rabe or bitter greens, it makes me wonder. Why are they choosing something bitter and robust and then trying to make it into a bland. Strange mentality. 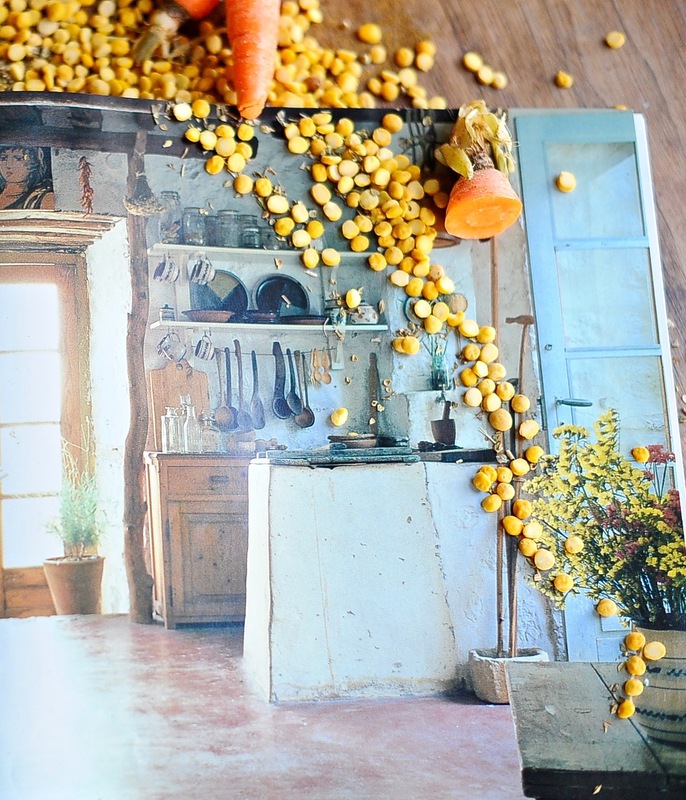 Did you use lentils (Lens culinaris) or yellow split peas (Pisum sativum)? The two are often confused but are not the same. I think yellow split peas (usually available skinless) are the more traditional base of this Greek dish, but lentils (usually with skins) can be a lot easier to find in some places. I love the E.M. Forster quote. I am reading T.E. Lawrence’s (Lawrence of Arabia) book The Mint right now. He corresponded with E.M.Forster on improving the text. Like the “p” in swimming. I remember loving the bloated consistency and swampy taste of those canned peas and how they popped with dull thuds against the roof of the mouth. You poem is worthy of the LODR. Perhaps Samwise will sing it after his rhapsody on Taters’. Perfectly matched with liver and a nice chianti. Oh my that sounds like an improvement. Pomegranate seeds would add a sparkle unmatched. Fava as desert? Why Yes! I remember our “little” snacks at Sunset Place on our magical island. Spooning lukewarn fava onto puffy crusty bread and breathing in true fresh salty air. I’ll fill a spray bottle with salt water and spray us while we eat this at our picnic table, and you can steal bits of my food like the wild cats did. Oh. Our little snacks as the sun melted gold into the sea. Meow. And I’ll probably climb into your lap at the end like a good kitty.